Fond of Snape » Blog Archive » I’m late!!! Which would you rather have: a high salary or job satisfaction? Job satisfaction, for sure. He has to love you, with a flower like that! Off to see Hiney today? I am always early and it makes me insane to be on time or late. Love the photo very pretty!!! Awesome photo, Janet. Good luck at the hospital this week. I run early-to-on-time, I can’t stand being late. 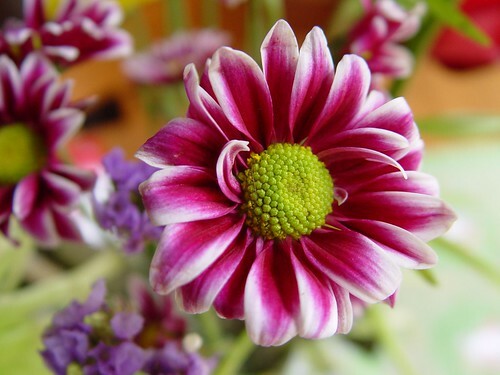 If you happen to see YOUR photo of that flower somewhere….don’t be surprised!! I love it!!! Another foreigner told me one time “You….are ALWAYS right on time.”….and he didn’t say it in a nice way either…I canNOT stand being late OR waiting for people who are. I apologize profusely when I am. I’m getting kind of tired of “job satisfaction”….can I have “high salary”….for just a little bit? Please! hope you made it to the doctor’s …. as “they”* say better late than never! How about high pay and high job satisfaction? Or is that being too greedy? I LOVE this photo. The colors are perfect. I loved your second answer and thats why you’re such a great person. I’m a sucker for flowers and that one is gorgeous. My Bodyclock measures 24 hours as only 23 hours. So, yes, I’m late in the mornings. Not very well accepted by so called A-people.